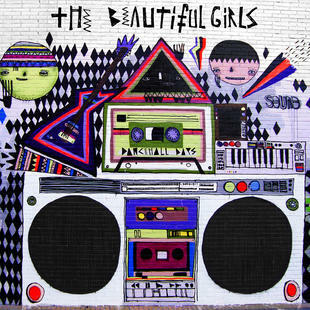 The Beautiful Girls’ fifth studio album, ‘Dancehall Days’ does what it claims on the box – it provides the perfect feel-good, toe-tapping music for the Australian summer. Mat McHugh’s eclectic vocals make a welcome return on the crowd-funded album, after the festival favourites’ hiatus. In the band’s down time, McHugh has been ‘’exploring a life’’ – and the musical result is vibrant from beginning to end. The first number is titled ‘The Beautiful Girls are Dead’, reminiscent of songs played backwards to discover the satanic message apparently contained within. This brief introduction segues into ‘Until My Kingdom Comes’, a more familiar mix of electronica and the occasional hand-clapping, which is almost impossible to fight replicating. The musical cacophony continues on ‘Stars’, with the addition of a saxophone to accompany McHugh singing “somehow we lost our way” – luckily for fans, this is not the case after the band’s break. Thematically, relationships seem to play a big role on this record. McHugh declares “I don’t wanna be alone tonight” on ‘Real Love’. However, it’s not all about heartbreak, with the last track ‘Number 1 Stylee’ asking to ‘’play me the love I need to save my soul” – and if any music can do that, it’s this soft reggae tune, with sound effects that remind this reviewer of the original Nintendo. The title track is representative of the fun to be had. The lyrics reveal that McHugh is “blessed” and talks of dancing until the ‘break of day’ – and with the electronic beats, piano and trumpets, why wouldn’t you join him and the band at that dance hall? Happily, fans will be given that chance during a national tour to coincide with the album’s impending release next month. If this record is anything to go by, the shows promise to see the band at their eclectic best. This entry was posted in Music and tagged Album, Dancehall Days, lip, lipmag, Mat McHugh, music, Review, The Beautiful Girls. Bookmark the permalink.